Alaouites (Alawite State) was a League of Nations mandated French Territory from September 2, 1920 to September 22, 1930. It was renamed as the Sanjak of Latakia in 1930. It is located in present-day western Syrian coast. The area had a total land area of 2500 square miles and a population of around 278,000 in 1930. France occupied Syria following World War I (WWI) and the Alawite Territory was autonomous at the time. On July 1, 1922, it was incorporated into French Syria. The territory became an independent state administered under the French Mandate in 1923. Alaouites started issuing stamps in 1925 and stamps were issued until the territory was renamed Latakia. 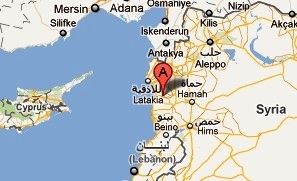 Latakia in turn was disestablished on December 5, 1936 and the area was fully incorporated into Syria. Syrian stamps superseded Latakia stamps in the area from 1937 onwards. Alaouites did not issue any stamps in original design. All the stamps were overprints on original issues of France or Syria. The first stamps of Alaouites were a set of fifteen stamps issued in 1925 that ‘Alaouites’ overprints on issues from several long running French sets from the turn of the century till around 1937. The designs from the sets that were used for the overprints include two Sower designs, the Liberty, Equality, and Fraternity allegory, and the Liberty and Peace allegory. The set (Scott #1 to #15) of fifteen stamps catalogs for around $70 MNH and slightly more for Used. A sister set of six stamps on the Louis Pasteur set (Scott #185 to #196) of twelve stamps of France that ran between 1923 and 1936 were also released. That set (Scott #16 to #21) catalogs for around $15 MNH and a little more for Used. Used covers featuring the first issues catalog upwards of $50. The first overprints on Syrian stamps were a set of thirteen stamps issued on March 1, 1925 that were ‘Alouites’ overprints on stamps from the Syrian Local Scenes set (Scott #173 to #185). The set (Scott #25 to #37) catalogs for around $25 MNH and around $30 Used. The designs show Mosque at Hama, View of Merkab, View of Alexandretta, View of Hama, Omayyad Mosque of Damascus, Latakia Harbor, View of Damascus, View of Palmyra, View of Kalat Yamoun, Bridge of Daphne, View of Aleppo, and Columns of Palmyra. A few other surcharge overprints of 1926 and 1928 complete the entire stamp issues of Alouites. A complete set of stamps can be relatively easily acquired. Varieties that include inverted and double overprints are a good collectible option although valuations for those items are upwards of $10 each. Color varieties on the overprints (Red, Black, or Blue) are another option. Here again, certain color overprints fetch a premium in the $10 range while others catalog for only a very slight premium over the common overprint colors.